African-American Women Look to Leverage their Power in Healthcare | The Leverage Network Inc. African-American Women Look to Leverage their Power in Healthcare – The Leverage Network Inc.
Healthcare, like every other sector in our economy, continues to lack diversity in its leadership ranks. Despite decades of talk about this issue, the people in the C-suite and the boardroom remain largely white and male, and do not reflect the patient populations being served. This in turn has impacted health disparities and access to quality care among people of color. The Leverage Network is all about changing this dynamic. A nonprofit on a mission to increase the representation of African-Americans in executive and board roles, as well as in businesses receiving opportunities in healthcare, the group hosted the Second Annual Executive Women of Color Summit, (EWOC 2017) May 24-25, 2017, at the Hyatt Scottsdale Gainey Ranch in Scottsdale, Arizona. The theme was Leveraging our Power: Running it; Owning it; Advising it. Summit participants were senior executives, business owners and women who sit on major healthcare and corporate organizations. Leverage designed the EWOC 2017 Summit as a trusted and safe environment where African-American women – Sister Leaders – could share authentically and unapologetically their experiences, challenges and successes in their roles across all facets of both their personal and professional lives. Women participating in the Summit walked away with tools and resources to further their success and professional growth while simultaneously creating an influential network to leverage change. Mellody Hobson, President, Ariel Investments, introduced by Lloyd Dean, CEO, Dignity Health, opened the Summit in a conversation about “Being an Unapologetically Black Woman,” which set the tone for the EWOC experience. 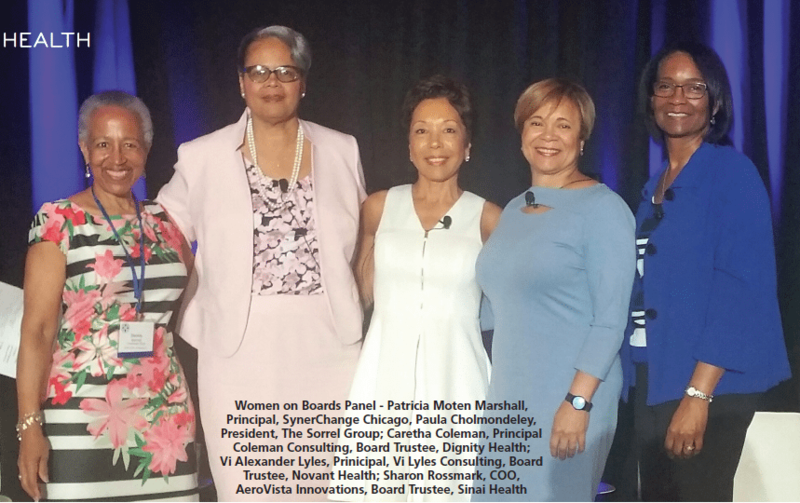 Each session was led by remarkable African-American women, CEOs from major healthcare systems, women sharing their experience as board trustees of corporate and healthcare boards and sisters leading multi-million dollar businesses. Sheryl Sandburg, author of “Lean In,” recently stated that four years after the publication of her book, women are “still no better off.” Currently less than 6% Fortune 500 CEO positions are women. With recent decisions to step down from CEO roles by Ursula Burns (Xerox) and Rosalind Brewer (Sam’s Club), African-American women are now unrepresented. In healthcare, African-Americans held only 8% of C-Suite roles in 2015, a 1% decrease from two years prior, and just 9% of board seats despite 36% of the population served being minority, according to a recent study by the American Hospital Association. It is past time to redress this inequity, speaker after speaker told the attendees. “If we do not intentionally leverage the power and influence we possess there will be no next generation of Sister Leaders in this country. It is up to us to take charge of our destiny,” Waller said. “African-American Women Look to Leverage their Power in Healthcare.”SAVOY Magazine Summer 2017: 20. Print.